Stomaci Restaurant WordPress Theme is a gorgeous premium theme from Themes Kingdom. 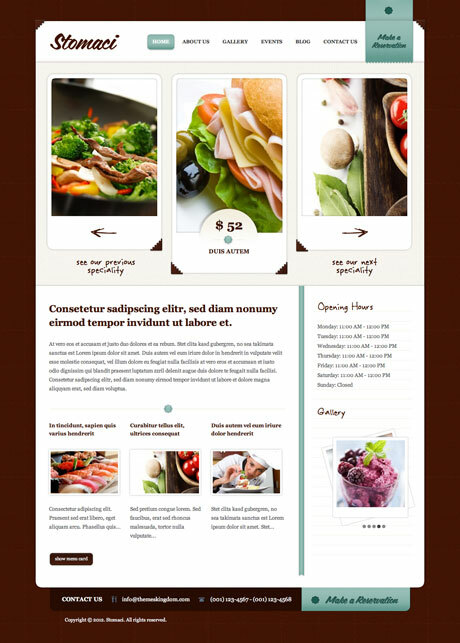 Perfect for restaurant, cafe, or delicatessen owners – this theme captures “DELICIOUS” in an elegant and inviting way. We eat with our eyes, so they say, and this theme allows you to do just that. The uniquely designed photo slider lets you display your gastronomic creations seamlessly. A lot of people look to the Internet for all sorts of information and more and more use it to discover new places to dine. This theme will easily make you stand out from the rest. Visitors will really appreciate the online Menu Card and the Make A Reservation features included in this theme. Restaurant owners whose menu constantly change based on the freshest ingredients available for that day will find the ability to change their online menu really helpful. The Make A Reservation feature makes planning for functions, meetings or intimate parties a pleasant experience for both owner and customers. Customization – Customize the theme and make it your own. This theme comes with at least 6 different color styles to choose from.